Both Yoga and Ganahoma has the same intention. That is prepare the body and mind for divine connection. Yoga strengthens the body and improves concentration to receive divine connection. In Ganahoma the fire purifies and revives the senses the eyes, ears, nose and the skin, nadi shuddhi (cleansing of the nerves), ignite the fire in brain through mantras and prepare body, soul, mind to receive divine connection. Exactly 4 g connection to your smart phone :) if it is done with utmost faith, dedication, devotion, with right ingredients, right technique, right priest. Most of us may be aware of the significance of the Ganahoma as we also do know yoga and its benefits. But when we link to the spiritual side of the meditation, we can understand how advanced our ancestors and India is. The current situation is that the west has aggressively adopted yoga into their daily life routine just like going to a gym. You walk into any gym in neighbourhood, there are group programmes on yoga, pilates, etc. Yes in India too we have many yoga studios, classes, organizations and other things, they have cropped up in India after yoga was popularized by the west. But even today in India majority of people have not yet instilled yoga in their daily life despite the many attempts of Shri Shri Ravi Shankar and Baba Ramdev and the latest fad Mickey Mehta's 360° Wellness Temple and Shivganeshyoga bringing out good yoga teachers. I hope the central government and state governments eventually include one period as Yoga period in the school curriculum. As a Hindu major country include shlokas, yoga sutras, meditation etc. in that yoga period and make it compulsory and bring out a uniform curriculum throughout the country. This vision may be a near reality with our Prime Minister Modi himself practices yoga and supports yoga. As we all know Ganahoma is a pooja to Lord Ganapathi to bless us with health, wealth and happiness, and to remove any obstacles on our way to success be it in academics, sports, business, family, new ventures, inauguration of a home or shop etc. Asking Lord Ganesha to be present and help in any human related efforts. T.A. Balasubramaniam in his website on homas has explained about Ganapathi homam beautifully. There are many types of Ganapathi homam according to Ganesha Purana like Mahaganapathi Homam, Ashta Dravya Ganapathi Homam, Sahasra Modaka Ganapathi Homam. I could understand the spiritual connection between mind, body, soul and the dimming of the five kleshas (Avidya - ignorance, egoism - asmita, raga - attachment, aversion - dvesa and abhinivesa - fear of death as per the Samadhi Pada of the Yoga Sutras. I have linked many websites and articles from the internet to share the knowledge for educational purpose only. I thank them for helping me put together this article on Ganahoma. 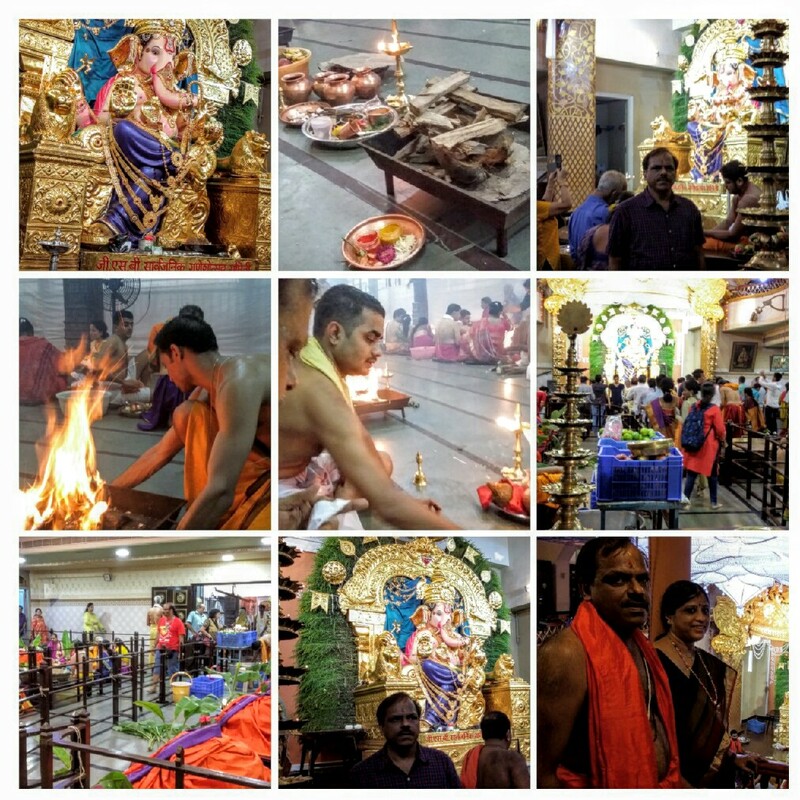 Konchady Vasant Pai has shared his experience of Ganahoma - He says " In our family, it is more than a hundred years since Ganesh Chaturthi and ganahoma are performed without fail. The holy smoke acts as a fumigant, disinfecting the dwelling, and it purifies the lungs of the inhaler. As the priest chants the mantras and feeds Agni with ghee, panchakajjaYa and naivedya we experience a spiritual exhilaration." When people cannot cannot visit their family Ganapathi due to some reasons, they perform Ganahoma at the Sarvajanik Ganeshotsav (community Ganapathi celebrations) venues. One can also perform Ganahoma at a community event or temple Check with your local temple if they offer Ganahoma Seva. If you live abroad then check your respective area hindu temple online for sevas. Another GSB venue that performs community Ganahoma is GSB Seva Mandal at which has a 24 hours various pooja service for 5 days starting from Ganesh Chaturthi day annually. The details of seva are here. Please write in comments your experiences on Ganahoma, incidents relating to Ganahoma, more knowledge on Ganahoma pooja and traditions. This article on Ganahoma is open for corrections/additions/deletions (in comments below) You may also share your recipes of Panchakajjaya and other naivedya items. Please add your blog address for me to share articles related to Ganahoma. Here is one from Pratibha Rao, in her blog The Indian Food Court has given detailed pictorial recipes of four Panchakajjaya according to the related festivals. Very informative and an eye opener about the beneficial effects of Ganahoma both to the body and soul. Having performed ganahoma day before yesterday in my house (this was started by my ancestors more than a hundred years ago and being carried out by the eldest of the family in each generation ) and inhaling the sacred fumes I feel cleansed spiritually. After performing the pratishta, pooja and ganahoma on Ganesh Chaturthi day, a unique sense of peace and tranquillity pervades the mind. You are right in pointing out the connection between yoga and homas. They both supplement and complement each other. It is nice to know that you are sperading the awareness about ganahoma to your readers through this well written blog. God bless you. thank you vasanthmam for sharing your wonderful experience and encouraging me.